Monday 10:00am-9:00pm , Tuesday 10:00am-9:00pm , Wednesday 10:00am-9:00pm , Thursday 10:00am-9:00pm , Friday 10:00am-9:00pm , Saturday 9:30am-10:00pm , Sunday 11:00am-10:00pm . Meadowvale Town Centre offer more than 82 brand name stores. 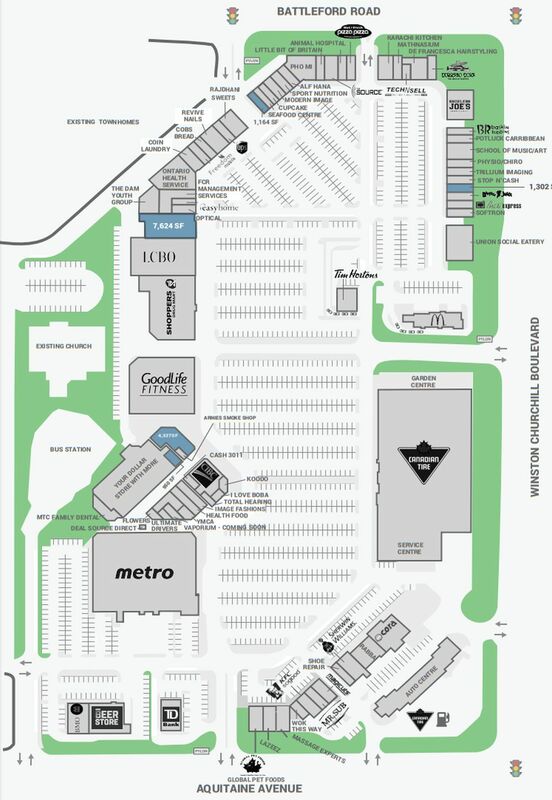 Meadowvale Town Centre is located in Mississauga, Ontario - 6677 Meadowvale Town Centre Circl b1005, Mississauga, Ontario, ON L5N 2W7, Canada (GPS: 43.582981, -79.759917). Look at the list of stores in Meadowvale Town Centre, hours, location and information about mall and special events, sales, coupons. You can choose store from list below and get detail information - other stores locations for the brand, location, shopping hours, phone, map, directions contact. Meadowvale Town Centre is one of the best shopping place for spend your free time - mall/shopping center has all types of stores - outlets, department, fashion, traditional and more. Have you ever visited Meadowvale Town Centre? Do not forget to write shopping review and rate your satisfaction. Meadowvale Town Centre is an open door shopping centre, which is located in Meadowvale Town Cente Cirbl street in Mississauga, Ontario. The large of the mall’s rental space is 411 870 square feet in total. This shopping centre is managed and owned by First Capital company. This Company is focused on urban properties where people live and shop for everyday of life. First Capital Realty is one of Cnada’s largest owners, developers and managers of grocery anchored. Meadowvale Tonw Centre offers over 67 shops and services. Major tenants are: Metro, Canadian Tire, Shoppers Drug Mart, LCBO, TD Canada Trust, CIBC, Bank of Montreal, The Beer Store, Tim Hortons, McDonald’s and GoodLife Fitness. There are some examples of other brands and services, which you can find in this lovely shopping mall: COBS Bread, Rabba, Rogers Wireless, Shoe Repair, Coin Laundry, Cavery, BMO, Baskin Robbins, Cora, Cupcakes, Dental, Smart Vacuum, EB Games, Extreme Pita, Flowers, Teriyaki, Easy Home, Thai Express, Union Blue, Tim Hortons, The Dam Youth Group, Wok this Way, Nail Salon and so on. Meadowvale Town Centre - Mississauga Area, Ontario ON L5N 2W7. Click on the button and get directions to Meadowvale Town Centre. Mall/Shopping center is also displayed on the map with gps for your navigation. The staff are busy discussing personal stuff. See a customer standing just ignores and then when a white Pedro comes they attend immediately. The manager on duty is rude does not apologize for making the customer. Worst place ever!!!! I love this mall except for certain people who loiter around the lotto booth and who gossip, talk thrash and intimadate other shoppers like myself and others. Hopefully something is done. Give us your experience with Meadowvale Town Centre by writing a short review.